One evening last week, I found myself in the luxurious surrounds of The Montagu restaurant in the Hyatt Regency Hotel – The Churchill* with a mouth-watering display of Charlie & The Chocolate Factory-inspired desserts in front of me, a special pudding menu to coincide with the opening of the new Charlie & The Chocolate Factory musical. To say I was excited to dig in would be an understatement. I don’t know about you, but I have always wondered what Willy Wonka’s wacky treats would taste like (perhaps not the Three Course Dinner chewing gum, mind) and the restaurant have come up with the next best thing. Cleverly, each dessert had been designed with a character from the book in mind; they may have not had a happy ending in the famous story, but each was a revelation for a dessert fiend like me. I began with Violet’s blueberry mousse with blueberry compote, complete with a little icing Violet Beauregarde, who in the 2005 film turned into a giant blueberry after getting her hands on Willy Wonka’s newest creation Three Course Dinner chewing gum. In his defence, he did warn the gum chewing enthusiast that it wasn’t ready, but alas she didn’t listen and had to be rolled out of the Inventing Room by a team of Oompa-Loompas. 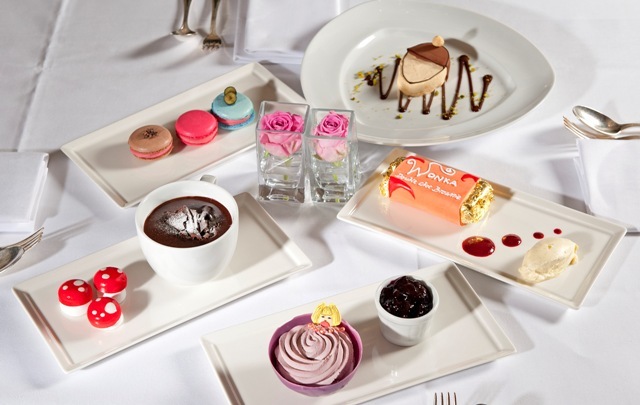 Talking of the Three Course Dinner chewing gum, one of the desserts – Bubblegum macaroons – was inspired by this (one representing tomato soup, one roast beef and one blueberry pie). Don’t worry, they don’t taste of the above, but they are infused with a bubblegum extract to give them their bubblegum flavour! Next up I tried Veruca’s Nutty Parfait (she was a ‘bad nut’ in the story; you may remember that she was pushed down a garbage pipe by a band of squirrels). It was utterly (or should I say ‘nutterly’) delicious! One of my favourites from the dessert menu: Augustus’ spicy chocolate soup with a hint of chilli (so good that I had to get the recipe off the chef; you may see it on Thetwoscoops.com soon!). Mike Teavee’s Chocolate Cake was next – delicious thick squares of rich chocolate cake. TV may not be good for you (or for Mike in the story) but this sure tasted amazing. 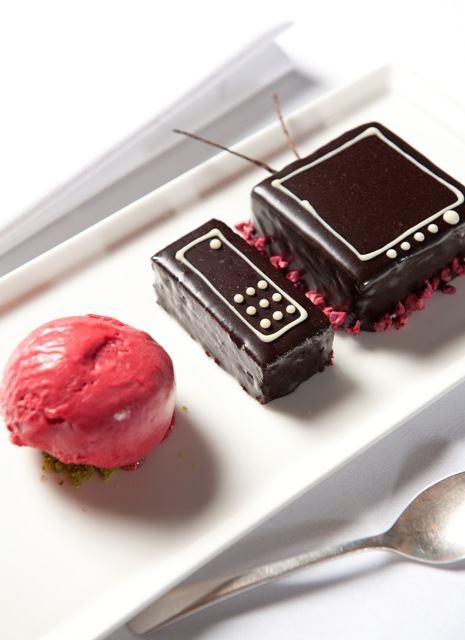 And what Charlie & The Chocolate Factory-inspired dessert menu would be complete without The Golden Ticket? It may not look like a dessert but beneath the icing label and gold leaf wrapper, you’ll find a yummy chocolate brownie. Official images used are courtesy of the PR company/hotel involved.